We have been buying and selling original posters for over thirty years. In 1986, we became one of the first auction houses dealing exclusively in original, vintage posters. In 1995, we launched an outlet in the San Francisco Bay Area. In 2000, we were the first establishment to allow live online participation in our poster auctions. You can participate in our sales live in person, by absentee ballot, or directly from the comfort of your computer or mobile device. We work on consignment and offer only original posters. Our auction catalogs are published in the highest printing quality. Our four annual auctions are usually scheduled during the months of February, April, September and November. In addition to our live and online sales, you can buy original posters through our online galleries on platforms such as Invaluable, Ebay, and posterconnection.com. We provide appraisals – quick or complex – and enjoy socializing about original posters through our Poster Spotlight blog. 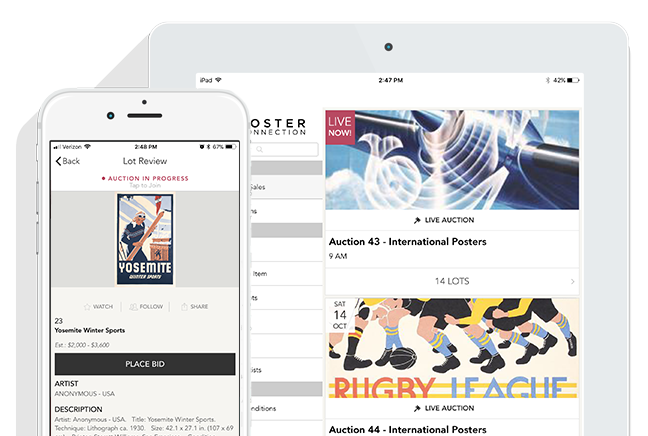 Whether you are a novice or an established collector, we invite you to contact us if you have any questions about our auctions or are interested in buying or selling vintage posters. We are proud members of the International Vintage Poster Dealers Association (IVPDA).